Last night on Facebook, I asked for suggestions for today’s post. I got a few awesome ones, so I decided to use them all for the next few posts. If you want to see anything specific, just leave a comment with a suggestion! It can even be as simple as a color (which is what inspired today’s post- someone requested green! ), or a technique for Mani Monday, anything! So today’s Flakie Friday (if I make it before midnight!) is a green combo! I decided to pair up Zoya Maisie and Finger Paints 15 Minutes of Frame! 15 Minutes of Frame was part of Finger Paint’s summer neons collection in June. It was actually the only one I picked up from this line. It’s bright, but not in your face. Love it! It’s not as easy to find now, but I’ve seen some of these appear in the clearance bins recently. This is 1 coat of Zoya Maisie over 15 Minutes of Frame. It’s another ‘subtle’ flakie look- Maisie is a green/blue flake mixture, so it adds a pretty shimmer to the green base color. Very pretty combo! I had a lot of lighting issues when I took these photos, so I just couldn’t get the flakes to photograph well. And just to REALLY show off how this polish looks, I swatched 1 coat over Cult Nail’s Nevermore. Mmmm… gorgeous! 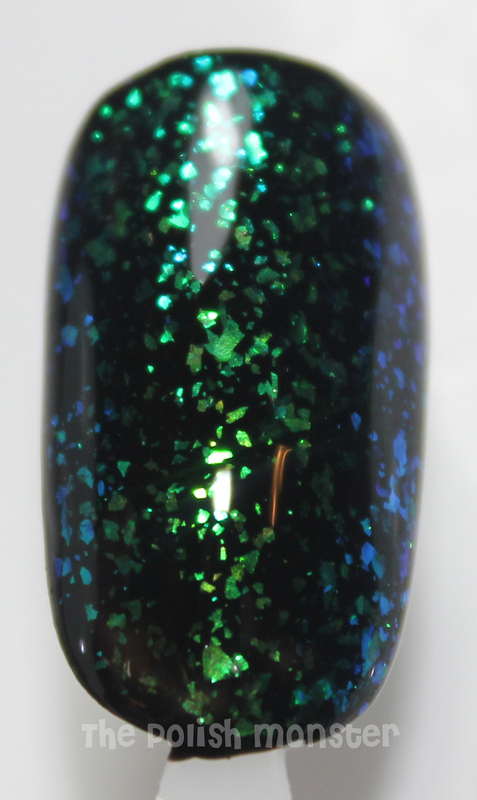 This shot really shows off the green and blue shifts of this topcoat. Finger Paints 15 Minutes of Frame can be found on Sally’s website here, and Zoya Maisie can sometimes be found in ULTA, and also via Zoya’s website. Want to get you own Zoya Maisie… for free? If you’ve never signed up for Zoya’s website before, you’re in luck! When someone clicks on your personal link and sets up an online account, a coupon for a FREE Bottle of Zoya Nail Polish will automatically be placed in their account and can be used immediately on their current order. TIP: If you use this coupon and add 2 more polishes to your order, you get free shipping too! The coupon will appear in the “My Coupons/ Promos” section of their “My Account” Page. As a disclaimer: I do receive 100 Share the Love points when you use my link- but that’s just more goodies for me to share with you all via posts and giveaways! Once you sign up- Zoya occasionally does promotions and other things for points, and you can share your link for points (and a free polish for friends! )- it’s a win win all around! This entry was posted on August 11, 2012 by The Polish Monster. It was filed under Uncategorized .